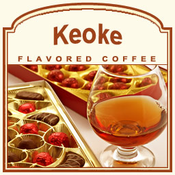 The Keoke gourmet flavored coffee is a savory and creamy Swiss chocolate flavor that features cognac, Mexican liqueur, and natural Arabica beans that will make your taste buds crave the sweet, deliciousness of all things chocolaty and liqueur infused. Although there is no alcohol in this coffee, the Keoke flavored coffee features undertones of fruit, spice, and warm whiskey flavors. This 2 calorie treat is impeccable in taste. A heat-sealed valve bag will ensure the freshest coffee possible � which is why Flavored Coffee.com roasts and ships your coffee on the same day. If you are looking for a splash of chocolate, whiskey, cognac, and spice � look no further than the delicious Keoke flavored coffee.